I know that I have been somewhat negligent about posting new stories on this blog, since March. It has certainly not been for lack of ideas of things to write about. During a six-week portion of that two or three month period, I had a very time sensitive contract with very long hours required. Usually what that meant is that I would wake up, go to work shortly after the sun was up, come home after dark and go to sleep (repeating daily). So now I have time to write once again – sorta. 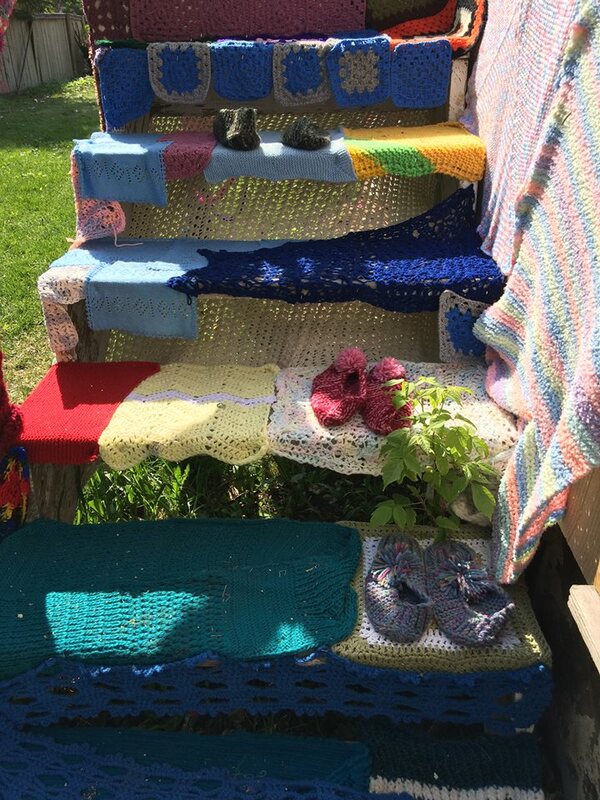 In my absence, the yarn-bombing project moved forward and is located at 832 – 10 Street NW (at the bottom of the hill below SAIT and Alberta College of Art and Design, and across the street from Riley Park). The organizers also involved the Hillhurst-Sunnyside Farmer’s Market. Obviously, a number of knitted or crocheted items were collected at the sale this past week. I am sure that there were other methods of collecting items to wrap the house as well, probably some of which were collected last summer as mentioned in my initial post. I have no idea, and I could be corrected on this, but I would assume that they would still be very interested in collecting more items for the house. I am sure if someone deposited more squares on the porch of the house, It would be my assumption that the items would eventually find a way onto the side of the building. Fortunately I have a few friends who have posted photos about the project on my personal facebook. They volunteered to help install quilts onto the house today. The photo at the top came courtesy of one of these people – Georgie. This lovely detail of a stairway (see above) came from yet another – Angela. CHF has purchased a home that has been slated for demolition; in its place, a brand new, fully accessible apartment building will be built and become home for 25 Calgarians exiting homelessness. . . This is My City Art Society (TMC) believes that the creative voice of every citizen has value and that we are all richer for having listened. The work that TMC does not only enriches the lives of the disenfranchised people in its programs, it opens the door for dialogue among all citizens. It builds bridges so that stereotypes can be broken down and common values can be clearly seen and celebrated. This is My City is a volunteer-run, nonprofit society that brings opportunities for positive creative expression into the lives of some of Calgary’s most marginalized citizens: the homeless and those at risk of homelessness. Professional artist-mentors bring their skills and love of art into the shelters and service agencies year-round and connect with individuals to make music, theatre, and visual art together. As mentioned in the press release, there will be a public event on June 9th at the wrapped house (which when I say this and I know it is a diversion, I can’t help but think of Cristo and Jeanne-Claude’s Wrapped Reichstag, Berlin 1971-1995) because the concept is similar, although the execution is much different. I suspect however, that this June 9th event will be mostly designed for the media to announce the newly built project which will be called Aurora on the Park, located on the yarn-bombing site. The address is 832 – 10 Street NW. Ironically, and I am going to go on a bit of a detour before I close, this location is probably a block (maybe two) away from the former Wreck City location which occured around this time in 2013, just before the flood. 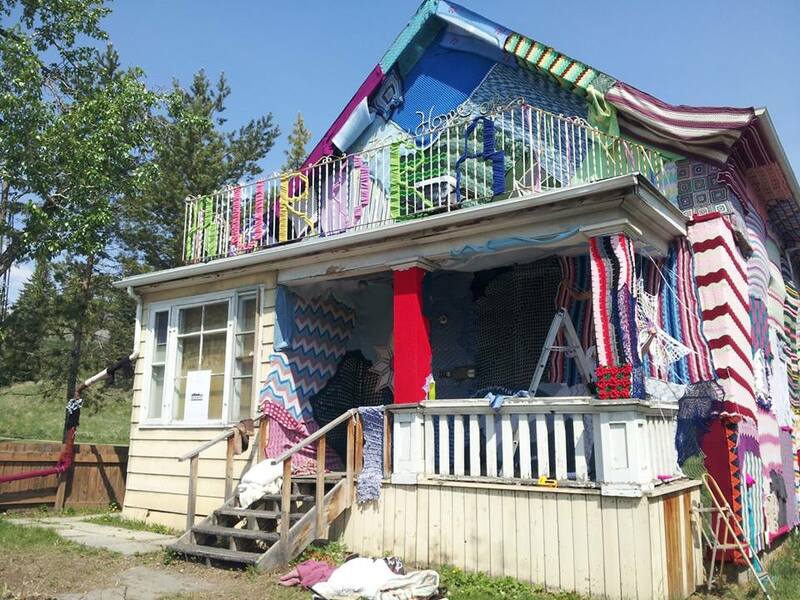 Those that attended the original Wreck City, may recall that one of the artists also quilted a portion of one of the house exteriors. If I recall correctly, the artist then was Suzen Green who also draped the Mario Armengal figures in Mummer’s costumes, which are/were located on the former Calgary Board of Education grounds downtown. In that way these two project relate somewhat, in a rather circuitous route. I hear through the grapevine that Wreck City after months of attempting to find a location for a reincarnated version of that project, has indeed found a new location about a block and a half away from the Esker Foundation. This event will take place next month, between June 19 – 28. I am sure that we will hear more about it in the near future. Meanwhile, here is a news story that talks more about what their initial plans are for the old Penguin Car Wash overlooking the city and the Elbow River in Inglewood/Ramsay. This entry was posted in Alberta College of Art and Design, Architecture, Calgary 2012, Corporate Public Art, Esker Foundation, Progress, Public Art, This is My City Arts Society, Wreck City.